Google Wallet has seen steady adoption and increased usage, while U.S. adoption of NFC continues to be met with skepticism. A Computerworld report has revealed that NFC transactions using Google Wallet have doubled since the August 1 launch of the app’s cloud version. While the increased adoption and use of its mobile Wallet is a positive sign, Google officials are keeping things in perspective. The overall success of Google Wallet is dependent upon NFC, and as adoption continues to lag domestically, Google realizes that success will not come overnight estimating that the NFC payment revolution is likely a 3-5 year process. Osama Bedier, vice president of Wallet and Payments at Google, remains optimistic that NFC-based payments are a better option than the QR code method employed by Apple’s Passbook app. The public’s opinion, however, will ultimately decide the success of the technology. U.S. consumer skepticism of NFC is partly the product of the well-developed credit-card ecosystem that has been in place for many years. Additionally, the jump to NFC payments will require new hardware in the form of both handsets and Point of Sale (POS) terminals— costs that any are not willing to incur yet. As The Verge reports, Google Wallet’s most significant challenge has been the company’s inability to install the app on every phone it ships. 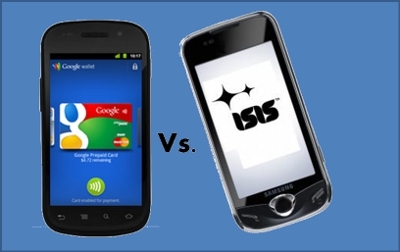 Verizon has been particularly difficult, likely due to its allegiances with the ISIS Mobile Wallet initiative. Bedier would like to see amore open solution, but as of yet Google and Verizon are still fundamentally at odds over a viable NFC-based solution. Fragmentation, then, may be a major barrier to NFC adoption in the U.S. as Google Wallet is no longer the only option for customers. The recent launch of ISIS’ Mobile Wallet— an initiative backed by AT&T, T-Mobile and Verizon Wireless— and Merchant Customer Exchange, a more recent effort backed by retail giants Walmart, Target and 7-Eleven, have crowded the NFC payments landscape and complicated the decision to adopt the technology. The concern from a consumer standpoint is a matter of quantity versus quality. While the number of NFC players increases and competition ensues to control the mobile payments market, there seems to be little progress being made regarding the public’s greater concerns over NFC. While much of this debate remains to be determined, one thing is for certain: NFC is coming. Bedier and Google are eager to see how the market will be structured— will there be one provider to rule them all, or will cooperation be the key? , and The Verge‘s articles.